I am currently serving in the Primary in our ward, teaching the Valiant 9 class as well as an Activity Day leader. I love Activity Days and coming up with fun crafts, lessons and projects for the girls to do that go along with the Faith in God for Girls manual. 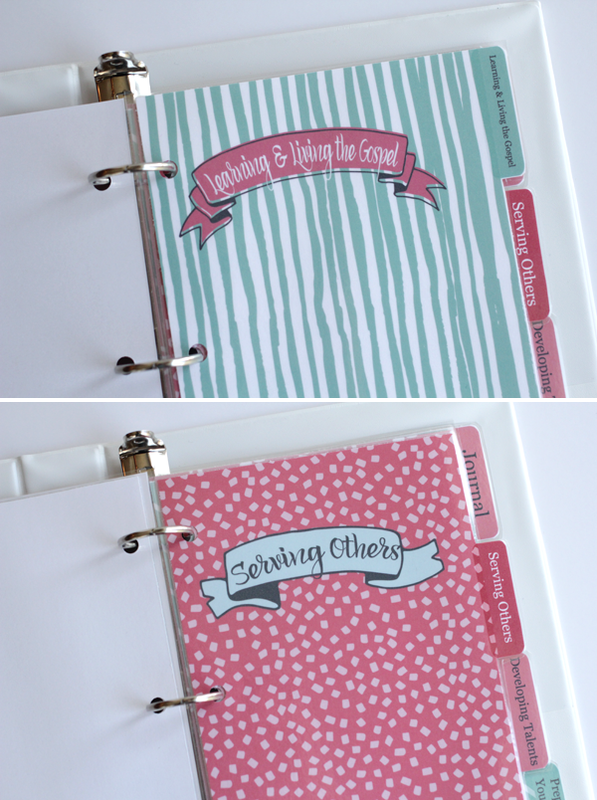 I wanted a way for the girls to visually see how they were progressing with the faith in God program so I created these fun binders. The girls were so excited to get these which made me happy since it was no quick ordeal to create them! These binders are half size binders- 8.5" x 5.5" , I chose the size so it wouldn't be overwhelming for the girls to carry around, and the small size makes them cuter. 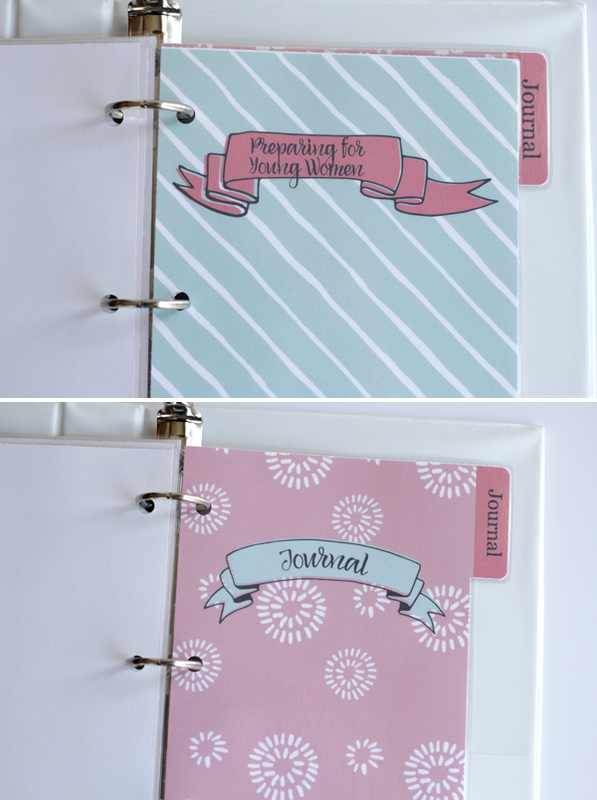 :) If you decide to make these you'll need an Adjustable 3-Hole Punch to hole punch everything that goes in the binder. 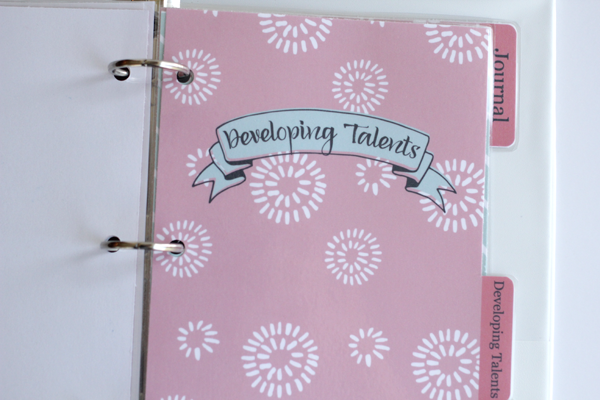 There is a tab for each category in the Faith in God program- Learning and Living the Gospel, Serving Others, Developing Talents, Preparing for Young Women as well as a Journal tab. I also created a page that goes in the front of the binder to track their progress in the Faith in God activities. 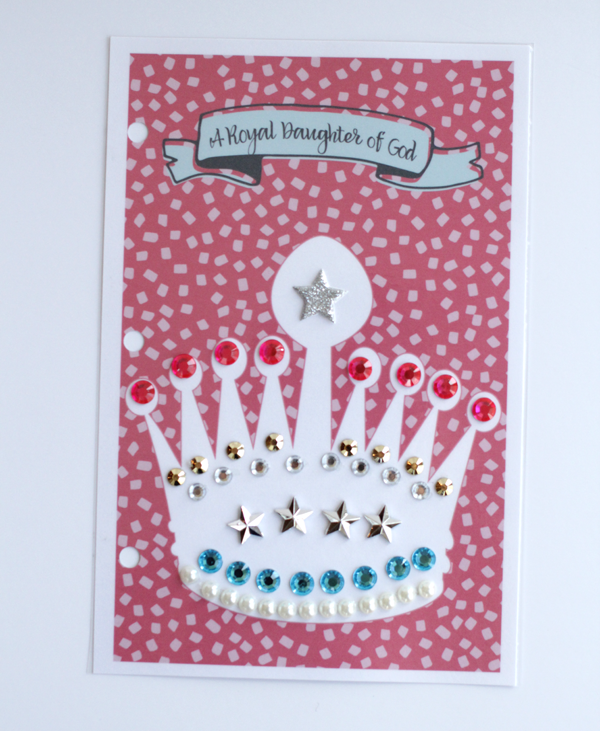 It says "A Royal Daughter of God" and has an image of an empty crown which gets filled up with gem stickers as they complete things. The idea behind the binder and having tabs for each category is that I will make handouts every time we meet and they will put those handouts in the related category section of their binder. I like the idea of the girls having a way to visually remember the activities they have been to and being reminded of what they learned. You can see my first example HERE. I also plan on incorporating journaling in our activity day meetings with time at the end to journal what they learned and they can keep those thoughts in the journal tab. The Royal Daughter of God progress tracking page has the girls earning gem stickers as they complete activities. In the manual it suggests to pass off 2 activities from each category each year (from ages 8-11). The girls may participate in more than just two acitivites in a category in a year but I only allow them to officially "pass of" and receive a sticker for the first two they complete in the year. I purchased all the stickers at Walmart. I also have tiny little gems that they can pick each time they come and add it anywhere on the crown for attendance. The cover is 2 to a page and the tabs are only 1 to a page, because of the tab part I couldn't fit 2 to a page however, after trimming I could laminate 2 tabs at the same time in the regular letter size laminating pouches. I use a Brother Printer that prints great color prints and I love that I can print up to 11x17 pages! After watching THIS youtube video I purchased the Refill Kit for Brother Ink . I've been printing a ton and haven't even made a dent in the ink bottles which has made printing so much cheaper! Basically using my printer totally eliminates trips to the office supply store. I also use a Westcott Paper Trimmer for all paper cutting and I love it, I use it all the time! I laminated every tab & the crown page, I use the Scotch Thermal Laminator with Laminating Pouches and I it works great. For this project I literally did it all at home, I love being able to print, cut and laminate at home. You can download the binder files by clicking below! I'm totally using this idea (along with probably the rest of yours). I'm thrilled you are doing this! AMAZING! I'm totally going to use this!!! I'm the CTR 7 teacher AND Activity Day Leader in our ward in West Virginia! 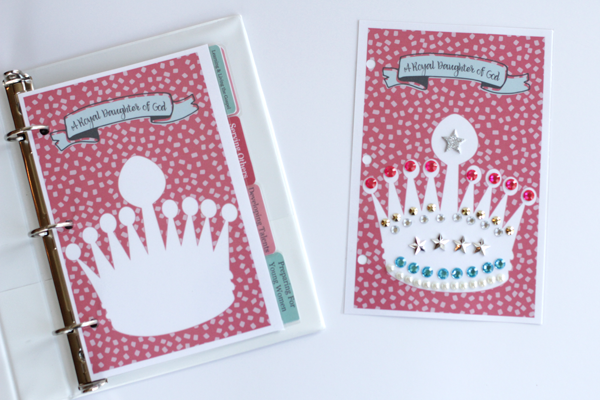 Thank SO VER MUCH for sharing your idea AND PRINTABLES!! You'll be blessed for sure!!!! I need to catch up and put some more activities that I've done on here! Thanks for your enthusiasm, it makes me so happy when I know people are using them! I just got in the binders and printed everything off just now! I am so excited for this. This is my first calling in the church since I joined a year ago and this makes me even more excited! this makes me so happy!! so glad you found my site and that you're enjoying your new calling! Thank you so much for these adorable binders!! I am the primary counselor over activity days and we are currently without a Leader due to a move. And they weren't using anything like this. I had used a large binder version I found several years ago in another ward, but this one is so much prettier and I love it is in the small binder size. Thank you Thank you Thank you for sharing this!! of course! so glad you like it! This is just what I have been wanting to do. 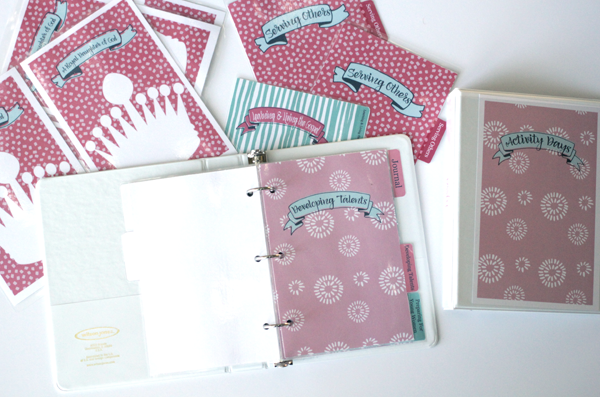 We have binders for handouts, but love the organization & cuteness of this one! Is there any way to resize the images with 2 to a page? I couldn't find mini binders in time! Thank you so much for doing all the work for us. This is such a cute idea. I am a senior and lack technology skills so that is so great to just have to print it out. Thank you so much for your wonderful ideas! I just became the Activity Day Leader in my ward and I really didn't know where to start. I just purchased the binders (through your link) and I am so excited to put these together for my girls! I truly appreciate all your helps to start me off on the right foot! You're welcome Kristen! Activity days is such a fun calling! You are right, this was no easy task! Everything came together perfectly and I absolutely love them and I think the girls do too! Thank you so much! Angela, I love this binder! I'm having some trouble when I download it though. The background on the pages don't show up - just the title and the tabs. Do you have any suggestions? These are so adorable. I have the binders on order and I've printed out all the sheets. I am laminating this week and getting them ready for the girls to assemble. Thank you so much for all of your work on this! These are fantastic and adorable! I have one question. What size are the gem stones you used? 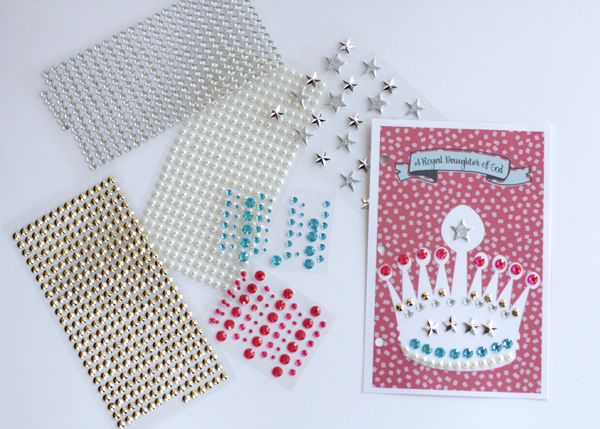 Since I don't have a craft store of any sort near me, I am having to order them on line. Thanks again! So adorable. I also do a binder with the girls but they scrapbook their activities. Is there anyway you could make this into a normal 8 1/2 X11 size for me? I will pay! Do you have an etsy shop? We have been doing 8 1/2 X 11 size binders for a year and I keep the binders with me at the church- because the girls kept forgetting to bring theirs! I would love these print outs for a normal size binder! Let me know. I will pay!! Hi, I love these printouts. I want to know though, do you have the girls take home their own binders and bring them every-time they come, or do you hold on to them for them? I love, love, love your binder idea! I have just been called as the Faith in God leader for girls in our ward. I was wondering if you have a tab page with no writing on it as i would love to add a section for the article of Faiths that the girls also need to learn. I am in the process of making these. Thank you for sharing them with us! You're so amazing! I was wondering, I am a little (ok a lot) OCD and would love to know which fonts you used so the schedule I make can have coordinating fonts. Please and thank you! I cannot for the life of me figure out the serif font. It's super close to Times New Roman so it would look similar enough. I made this several years ago ;) So glad you are using it! Thank you! You're an ANGEL!!! Thank you so much for all the hard work you put into these binders and activities and then so selflessly posted it so others could use it. I am not creative and I love this idea! I just printed all the tabs for the binder and bought the binders. I am looking forward to putting them together for the girls. Thanks so very much! !